Michael Rowden and his parents were never in for a big payday. They were the targets of a scam. Rowden’s senior citizen parents received a letter saying they had won the big one: The Publishers Clearing House Sweepstakes. It said they should contact their claims agent, Dave Sayer — the actual name of one of the real Publishers Clearing House’s prize-givers — at a specific phone number, to claim the $1.5 million prize. But Rowden recognized the letter for what it was: a fake. Rowden did some research about the supposed Publishers Clearing House letter, and found the letter really came from a Canadian address — even though the writers said they were from the real PCH address on Long Island. He shared what he learned with Bamboozled, hoping to inform other readers — and their elderly parents — about the con. The real PCH will never send you a letter for prizes over $10,000. For the biggies, you’ll always get a surprise knock on your door, the company said. PCH scams come in a few different flavors, but they follow a basic modus operandi. After the intended victim answers the pitch letter, the scammer promises to send a check — usually a small advance on the winnings. The victim is instructed to deposit the check to cover fees or taxes, and then get pre-paid debit cards or wire money to cover those fees and taxes. The scammers take the money, leaving the victim with an overdrawn checking account when the check bounces a few days later. Others ask victims for a credit card number to cover the costs. PCH does a good job informing consumers on its web site about how these scams work. PCH said if you receive a check claiming to be from a legitimate sweepstakes, but you’re asked to cash it and wire or send back a portion to cover fees, taxes or other costs, stop. “The check is not real! Consumers should always remember that at Publishers Clearing House no payment or fee is ever necessary to enter or claim a prize,” the web site warns. Same goes if you receive a phone call claiming you’ve won. PCH said it never notifies its winners by phone. PCH said it also never notifies major prize winners by email or text. For prizes under $10,000, the company may send a letter to the winner, it said. If you receive a letter, you can verify its authenticity by calling PCH customer service at 1-800-645-9242. It says you should never give a credit card number to collect a prize. “Fraudulent scam artists often request this information and then go on a spending spree with your credit card; or wipe out your bank account,” the PCH web site said. PCH also said it will never contact you on social media. If someone claiming to be from PCH sends you a friend request on Facebook, it’s scam. And PCH and its Prize Patrol — Danielle Lam, Dave Sayer, and Todd Sloane — never send private messages on Facebook. To report a scam, call PCH at 1-800-392-4190. If you receive a suspicious email, forward it to abuse@pch.com. You can also write to: Publishers Clearing House, 101 Winners Circle, Port Washington, NY 11050, and report it to the National Fraud Information Center, and the Federal Trade Commission. Have you been Bamboozled? 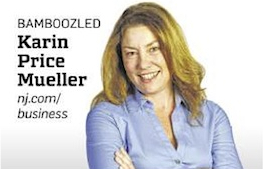 Contact Karin Price Mueller at Bamboozled@njadvancemedia.com.